From the Hancock County Courthouse, go east 0.3 mile on Hwy 15/16 to the fork at the Sparta Baptist Church. Bear left on Hwy 16 to the northeast and go 5.0 miles. Turn right on Hickory Grove Church Rd. Go 2.9 miles. The cemetery is located on the southwest (right) side of Hickory Grove Church Road and is located about 100 yards from the road, at the rear of a green-colored house, numbered 505.
s/o Albert H. Dunn and Pearl Clarke per Mary Ann Willoughby. w/o W. Harris Dunn; d/o Wm. T. Johnson & Luna Martin, per Mary Ann Willoughby. Middle, maiden names per obituary. d/o W. Harris Dunn and Vera Johnson per Mary Ann Willoughby. s/o Thomas B. Dunn, Sr. & Minnie Dudley per Mary Ann Willoughby. w/o Thomas B. Dunn, Sr; d/o James M. and Amanda H. Dudley per Mary Ann Willoughby. s/o James M. Dunn and Mary Elizabeth Dudley per Mary Ann Willoughby. d/o Thomas B. Dunn, Sr. and Minnie Dudley per Mary Ann Willoughby. s/o Thomas B. Dunn, Sr. and Minnie Dudley per Mary Ann Willoughby. w/o Alva Dunn; d/o O. Chaffie & Ellie Babb Hinsley per Mary Ann Willoughby. w/o O. Chaffie Hinsley; d/o James T. Babb & Susan Fredonia Johnson per Mary Ann Willoughby. d/o James T. Babb and Susan Fredonia Johnson per Mary Ann Willoughby. s/o James M. Dunn and Mary E. Dudley per Mary Ann Willoughby. w/o Albert H. Dunn; d/o Benjamin J. Clarke & Sarah (Sallie) Dickson per Mary Ann Willoughby. d/o Albert H. Dunn and Pearl Clarke; w/o Oscar L. Becham, per Mary Ann Willoughby. w/o Delos L. Dunn. d/o Benjamin J. Clarke & Sarah (Sallie) Dickson per Mary Ann Willoughby. s/o James Morris Dunn and Mary E. Dudley. d/o Delos Dunn and Massie Clarke. w/o James B. F. Dunn; d/o Israel F. Johnson and Mary Elizabeth Dunn per M.A. Willoughby. w/o William A. Askew and maiden name Smith per Mary Ann Willoughby. w/o Charles Amerson; d/o Thomas J. Dunn per Mary Ann Willoughby. w/o James Morris Dunn; d/o Thomas W. Dudley & Betheny Dennis per Mary Ann Willougby. Gravestone reads Mrs. J. M. Dunn. Info per Mary Ann Willoughby. s/o Augustus B. Dunn and Rebecca Kelley, and J.M. = James Morris per Mary Ann Willoughby. Child of James M. Dunn and Mary E. Dudley per Mary Ann Willoughby. First name unreadable. d/o James M. Dunn and Mary E. Dudley per Mary Ann Willoughby. No death year on stone. 2nd w/o Fay Dunn per Mary Ann Willoughby. Death year is 1997, per Mary Ann Willoughby. s/o Gordon L. Dunn & Anna Maude Clarke per Mary Ann Willoughby. 1st w/o Fay Dunn; d/o Oscar A. Meeks and Cora Hawkins per Mary Ann Willoughby. d/o Gordon L. Dunn and Anna Maude Clarke per Mary Ann Willoughby. s/o James M. Dunn and Mary E. Dudley per Mary Ann Willoughby. Birth year should be 1879 per Mary Ann Willoughby. w/o Gordon L. Dunn; d/o Benjamin J. Clarke & Sarah (Sallie) Dickson per Mary Ann Willoughby. w/o Carlos Dunn; d/o George P. Carr & Martha E. Dunn per Mary Ann Willoughby. s/o Carlos Dunn and Tommie Carr per Mary Ann Willoughby. h/o Sara Dunn; s/o Mirabo Toulson per Mary Ann Willoughby. s/o James M. Dunn and Mary E. Dudley; first, middle names are William Benjamin per Mary Ann Willoughby. w/o W. B. Dunn; d/o Samuel P. Johnson and Melissa Clark per Mary Ann Willoughby. 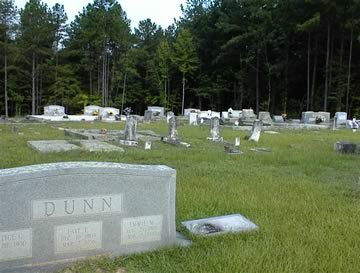 Only Mrs. W. B. Dunn appears on gravestone. d/o Wm. B. Dunn and Lizzie Johnson per Mary Ann Willoughby. d/o Charlie C. Dunn and Tynie Smith per Mary Ann Willoughby. Dates per Mary Ann Willoughby. No dates on gravestone. s/o Augustus B. Dunn and Rebecca Kelley per Mary Ann Willoughby. Co. I, 49th Ga Inf. w/o George P. Carr; d/o Thomas Jefferson Dunn per Mary Ann Willoughby. s/o Eli Carr & Cynthia Dorsey per Mary Ann Willoughby. s/o Augustus F. and Susan L. Dunn per Mary Ann Willoughby. w/o A. Bernard Dunn and maiden name per Mary Ann Willoughby. Only H. appears on stone. Infant s/o Dell and Pearl Dunn. Only one date appears on marker. w/o William A. Dunn; d/o Eli Carr and Cynthia Dorsey per Mary Ann Willoughby. s/o Thomas Jefferson Dunn per Mary Ann Willoughby. w/o J. T. Babb; d/o Israel F. Johnson and Mary E. Dunn per Mary Ann Willoughby. s/o James T. Babb and Donna Johnson per Mary Ann Willoughby. s/o J. T. and S. F. Babb. w/o James Thomas Dunn; d/o James M. Dunn & Mary E. Dudley per Mary Ann Willoughby. w/o Israel F. Johnson; d/o Augustus B. Dunn and Rebecca Kelley per Mary Ann Willoughby. First, middle, maiden names per Mary Ann Willoughby. Only initials on gravestone. s/o Stephen and Frances A. Johnson per Mary Ann Willoughby. Only rock at head and foot. Identity per Mary Ann Willoughby. d/o James M. Dunn and Mary E. Dudley per Mary Ann Willoughby. Only rock at head and foot. Identity per Mary Ann Willoughby. w/o J. M. White. d/o Augustus B. Dunn and Rebecca Kelley per Mary Ann Willoughby. d/o George P. Carr & Martha E. Dunn per Mary Ann Willoughby. d/o George P. Carr and Martha E. Dunn per Mary Ann Willoughby. s/o J. M. White and Elmina Dunn per Mary Ann Willoughby. d/o Augustus F. and Susan L. Dunn per Mary Ann Willoughby. w/o J. W. Pugh; d/o J. M. White and Elmina Dunn per Mary Ann Willoughby. s/o Carlos B. Dunn and Tommie Carr per Mary Ann Willoughby. w/o C. Pierce Dunn; d/o Benjamin F. Johnson & Nettie Farrell per Mary Ann Willoughby. Infant s/o Mr. & Mrs. Pierce Dunn. d/o Benjamin F. Johnson and Nettie Farrell per Mary Ann Willoughby. s/o Israel F. Johnson & Mary Elizabeth Dunn, per Mary Ann Willoughby. w/o Benjamin F. Johnson per Mary Ann Willoughby. Maiden name per Mary Ann Willoughby. Only initial appears on gravestone. w/o Charlie C. Dunn, d/o Ezekiel Smith and Ella Dunn per Mary Ann Willoughby. Maiden name per Mary Ann Willoughby. Only initial appears on gravestone. s/o Albert H. Dunn & Pearl Clarke per Mary Ann Willoughby. 2nd w/o James Morris Dunn per Mary Ann Willoughby. 1st w/o James Morris Dunn per Mary Ann Willoughby. s/o Dealos L. Dunn and Massie Clark per Mary Ann Willoughby. w/o Edward L. Dunn per Mary Ann Willoughby. s/o Benjamin F. Dunn and Mary A. E. Chiles per Mary Ann Willoughby. s/o Tom Cheely and Susie Hattaway per Mary Ann Willoughby. w/o Lewis G. Cheely; d/o O. C. Hinsley and Ellie Babb per Mary Ann Willoughby. s/o Earnest Dunn and Naomi Butts per Mary Ann Willoughby. s/o John E. Smith and Emily Johnson per Mary Ann Willoughby. 2 graves to the right of Ezekiel M. Smith. w/o Ezekiel M. Smith; d/o Thomas Jefferson Dunn per Mary Ann Willoughby. 2 graves, one with stones around grave and the other with one stone. h/o Waudie Dunn per Mary Ann Willoughby. PFC Co. E 121 Infantry. "Billy" All info from obituary. Age 60 All info from obituary.